NOW: Fabric artist Suzanne Tidwell prefers to call them Tree Wraps, although she good-naturedly agrees that Tree Socks is their popular name. 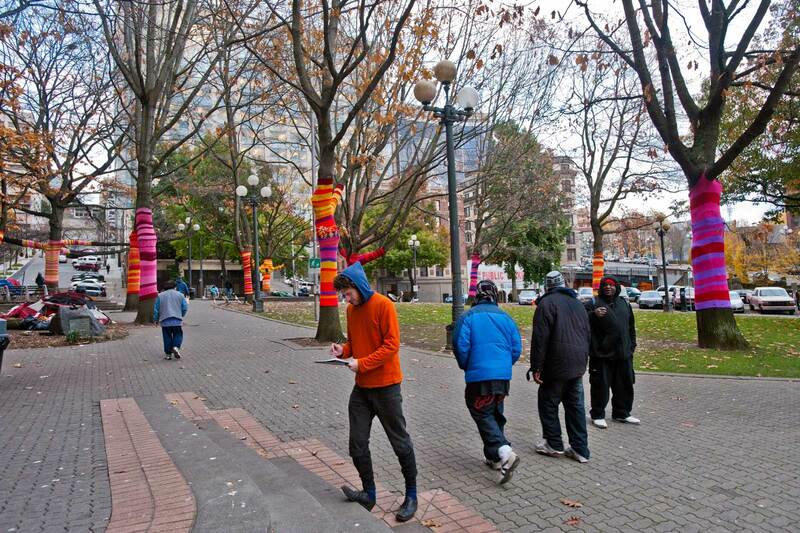 And popular they are, appearing not only here but also in Occidental Park and Westlake Mall. 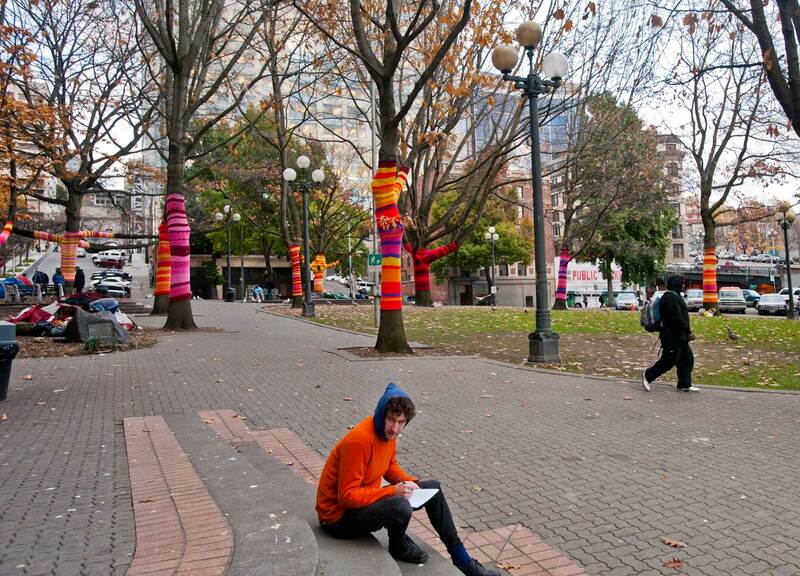 Made from water-resistant and durable acrylic yarn, the park’s biggest tree required, she estimates, about 40 hours of knitting and wrapping to install. Next stop for these “wraps” or “socks” will be Redmond. Jean, who again took the repeat photograph, loves them. In 1939 the Great Depression was grinding on thru its eleventh year. On Thursday April 6, Seattle Mayor Arthur B. Langlie ordered the protestors to remove their tent from the city-owned park by nightfall. It wound up only a few feet away pitched on an asphalt courthouse courtyard. County commissioners were more sympathetic than the mayor or the governor. That day the county’s Welfare Department, which had its funding reduced by 45 percent in March, released the latest figures on the number of King County citizens dropped from relief rolls because of the cut backs in state funding. It was 13,214. The grim irony was that the grand solution to the loss of jobs and lack of food was being prepared far off in Europe. That April the Pope was testing a Vatican bomb shelter, the Nazis were marching into Czechoslovakia, and soon after into Poland. It was World War Two that brought jobs to Seattle (and nearly everywhere) and food too – rationed – while also killing millions and flattening cities. 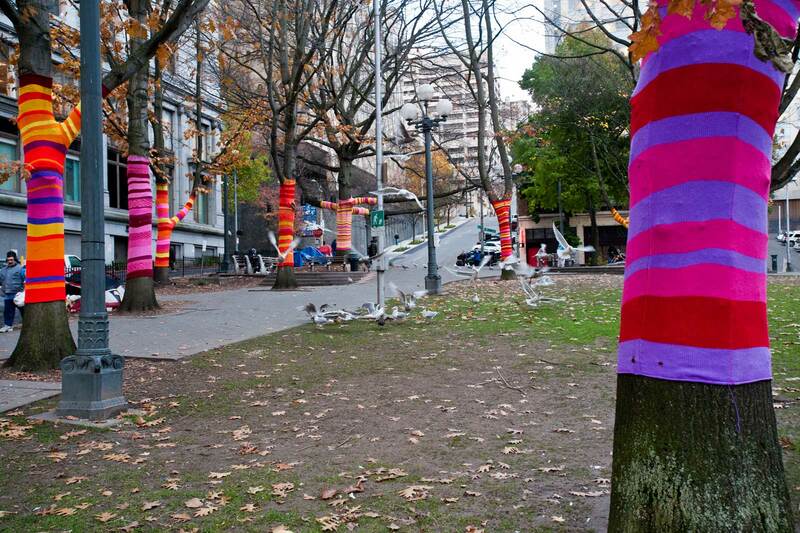 I thought I’d include a couple of pix of those wrapped trees, Paul. Welcome splashes of color to offset the dreary days to come. Certainly, Jean – but first bon voyage on your week off to southern California, and if you get into the desert we will be watching the blog back here in the gray and green Northwest hope you will send along some warming burnt umber pictures. And blue too. 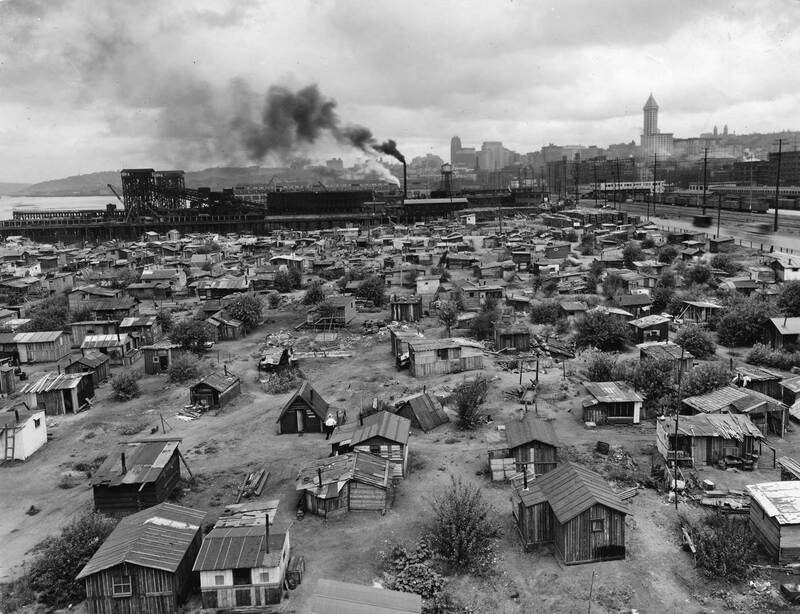 I’ve picked a few features from past Pacifics – mostly – that have to do with the neighborhood, and one that shows something of Hooverville, also during the Great Depression. We will start with a detail from the 1878 Birdseye of Seattle, and note there the clutter of small buildings that are depicted as holding the small triangular block (now City Hall Park) south across Jefferson Street from, in 1878, the Yesler’s orchard. The block with Yesler's orchard appears far-left in this detail from the city's 1878 birdseye. The street marked "Mill" was renamed Yesler Way. Our Lady of Good Help Catholic church is low in the subject and a little left. It sat at the northeast corner of Washington (which is named) and 3rd Ave.. To the left of the church (with a steeple) and across Mill Street is the triangular block, the site now of City Hall Park. And, again, to the left of that flatiron block and across Jefferson is the Yesler orchard, and in another six years after this sketch was published the construction site for the Yesler Mansion. 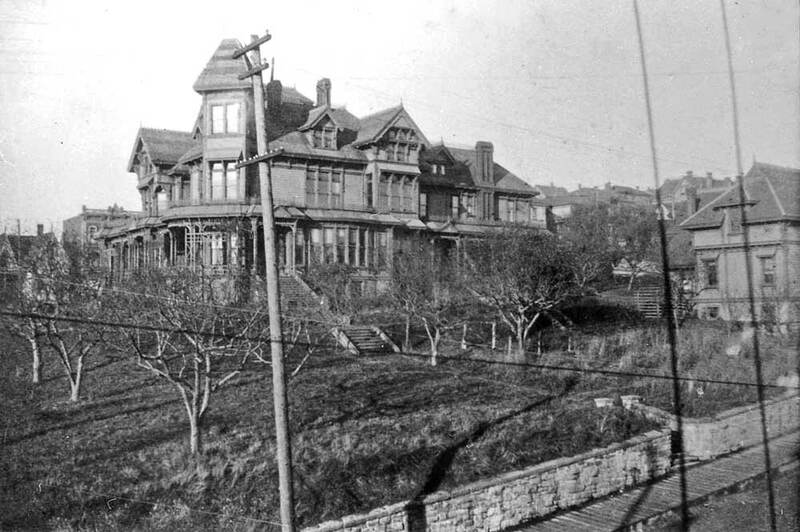 Next we will include a late 1890s look across Jefferson to both the orchard - what is left of it - and the mansion. Yesler Mansion and Orchard as seen from City Hall across Jefferson Street, ca. 1897. 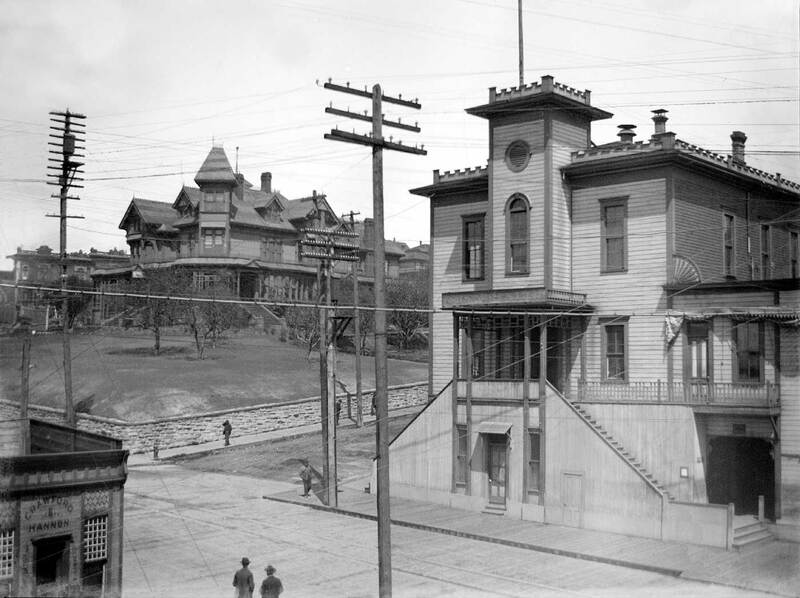 City Hall (aka the Katzenjammer Kastle), right, and the Yesler Mansion, to either side of Jefferson Street and facing Third Avenue, ca. 1899. Late construction work on architect Augustus Warren Gould's King County Courthouse. These first four floors were constructed between 1914 and 1917, you may estimate the year from that. City Hall Park is between Fourth Avenue, bottom-right, and Third. The odd-shaped block of grass shown here was called City Hall Park. The Seattle City Council’s first recommended name, Oratory Park, was rejected by progressives who claimed it was a political ploy to limit free speech to this open plot between Yesler Way (on the left), Jefferson Street, Fourth Avenue (bottom) and Third Avenue. 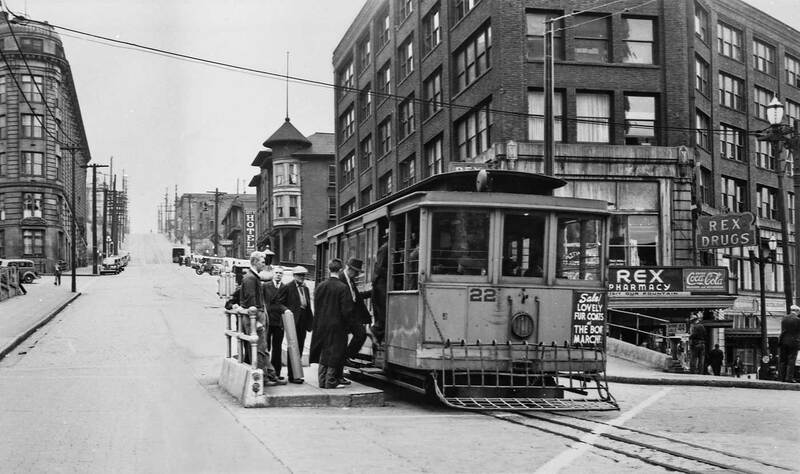 The year the park opened was 1913, when radicals – ”Wobblies” among them – used much of the business district, especially the Skid Road section south of Yesler Way, for soap-box oratory. 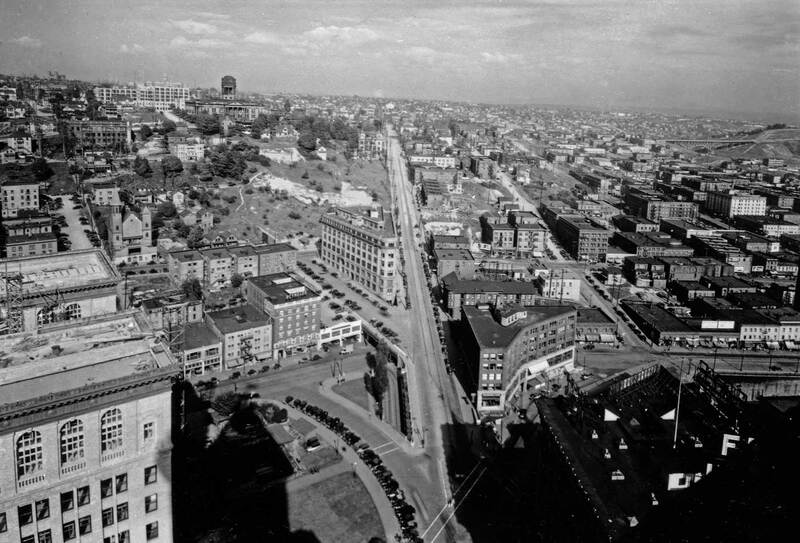 This top view was photographed around 1916, the year the ·first six stories of the City-County Building, far right, were completed across Jefferson Street from the park. Somewhat hidden in this view, Jefferson street may still be block by tunnel construction. The tunnel, from its entrance off Fourth Avenue just north of Yesler Way, curved beneath the street and park en route to parking in the new building’s basement. The entrance to the tunnel can be seen in the contemporary view photographed from the roof of the 400 Yesler Building, itself once a Seattle City Hall. 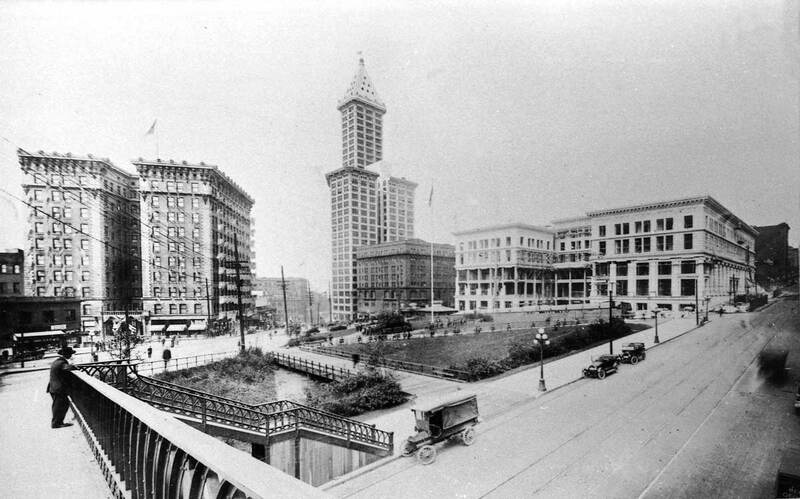 The contemporary view is paired with another early look at the park and County-City building also from the roof of the 1908-09 flatiron construction, between Terrace and Yesler and east of 4th. 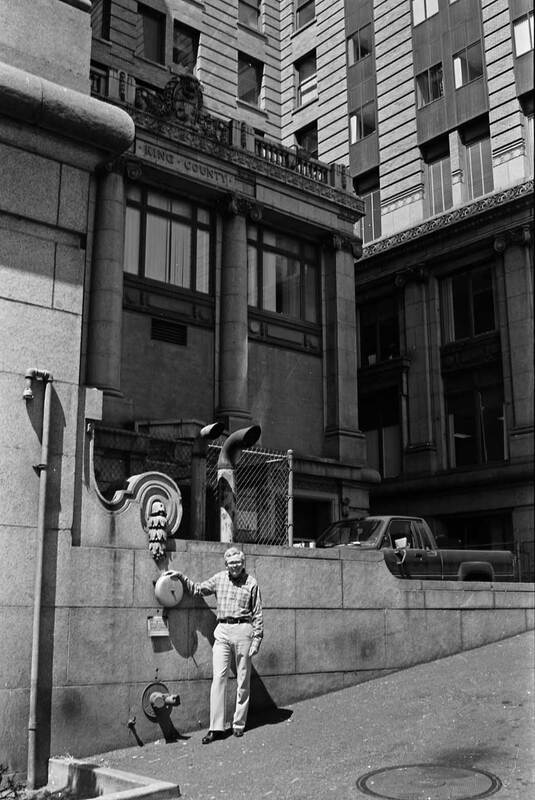 It was renamed for its address, the 400 Yesler Building with its restoration in the 1970s. 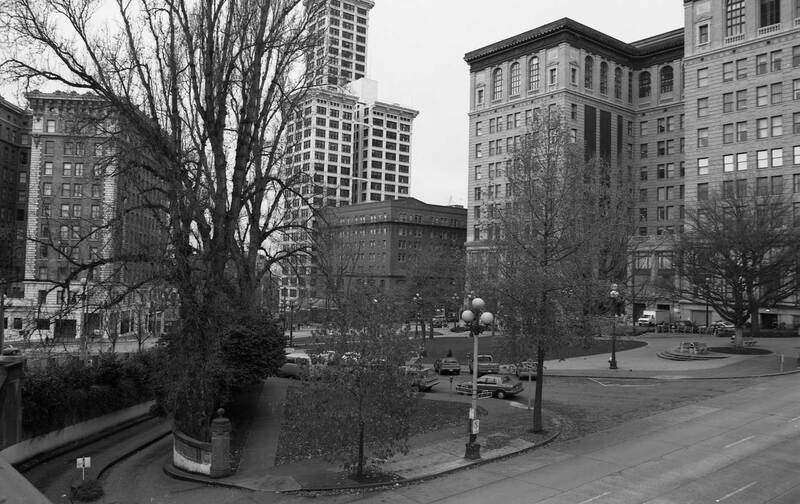 City Hall Park fro the roof of the 400 Yesler Building, Jan. 1994. The tunnel entrance is bottom-left. Same January '94 shoot, but from the ground. Back on the roof of City Hall - the 1908-09 Municipal Building taken by city offices, police, and health with the abandonment of the "Katzenjamer City Hall" name after the comic strip drawn with eccentric architecture.. City Hall Park is here first called Court House Square. Photographer Asahel Curtis' 1930s record of the enlarged City-County Bldg beyond City Hall Park. Mayor Dore addressing a depression-time protest in City Hall Park. The photo was taken from an upper floor of the County Court House. The banner lifted over the crowd reads, "National Unemployment Council." 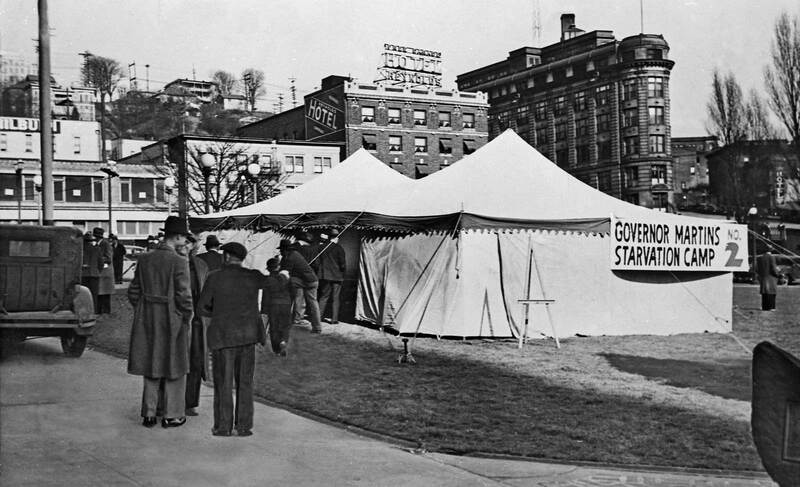 City Hall Park was used during the Depression for mass meetings of the unemployed and during World War II as drill grounds for the Seattle Air Defense Wing (housed across Yesler Way in the Frye Hotel, far left). In the mid-1950s it was redesigned with new walkways, trees and plastic game tables. In the late ’60s the City-County Building was remodeled and its entrance moved to Third Avenue. Now (in 1994) the county is studying plans to return a restored grand entrance to Jefferson Street. City Hall Park itself was closed, landscaped and rededicated in 1993, in part as an attempt to retard its common-use then as a “Muscatel Meadows” by the down-and-out. Above: For a few years after the 1909 razing of the old Katzenjammer City Hall, the future City Hall Park was used for a variety of public gatherings and carnivals. 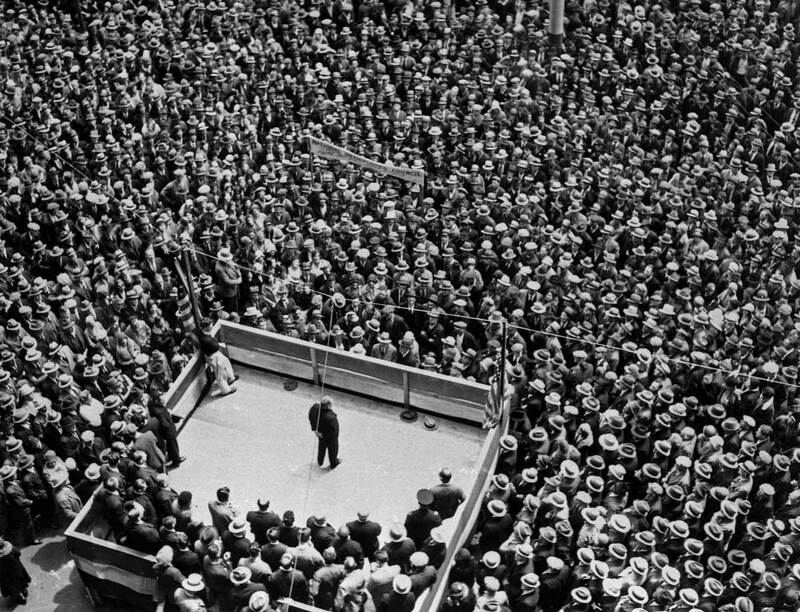 Here a crowd is – or may be – listening to a speech delivered from the covered platform on the right. It sits at the southwest corner of Jefferson and Fourth Ave. 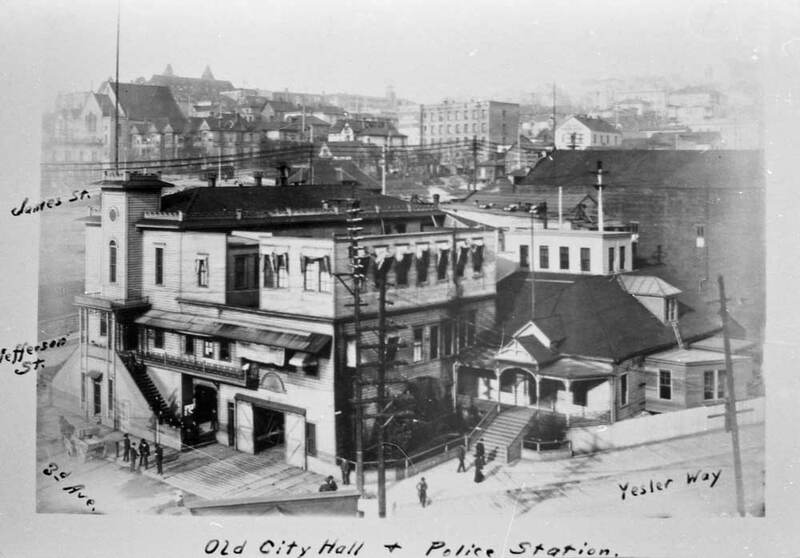 The super-sized Coliseum Theatre took the place of the Yesler Mansion and orchard until it too was razed for the building of the City-County Building, aka the County Court House. Following the "Great Fire" of June 6, 1889, the front lawn of Yesler's Mansion was given over to temporary quarters for a few of the businesses that loss their quarters to the fire. This view looks south on Third Ave. from James Street. The Katzenjammer City Hall appears, with its tower, on the right. 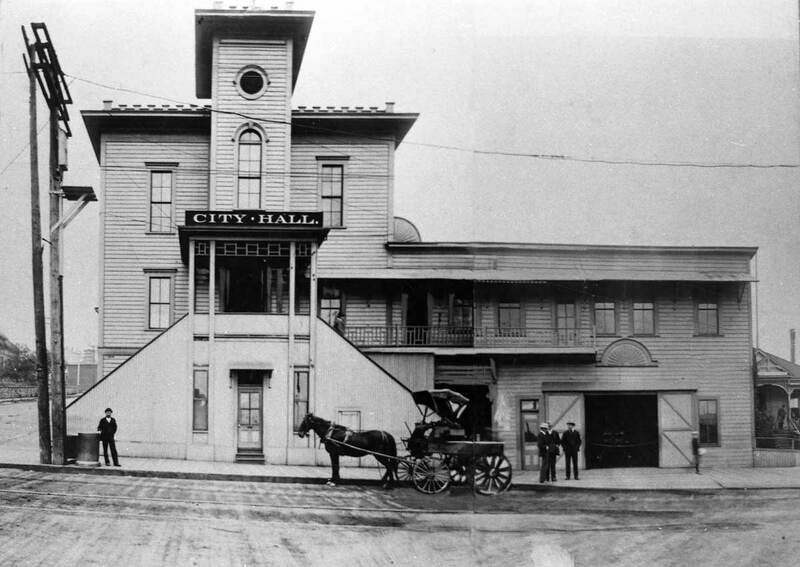 Another County Court House was built on First Hill soon after the 1889 fire. It is seen here on the horizon. Below it is, again, the Katzenjammer Kastle - of a City Hall. Yesler way is on the right. The subject was recorded late in the life of the Kastle. The Katzenjammer face-to-face, across Third Ave. Jefferson St. is on the left. 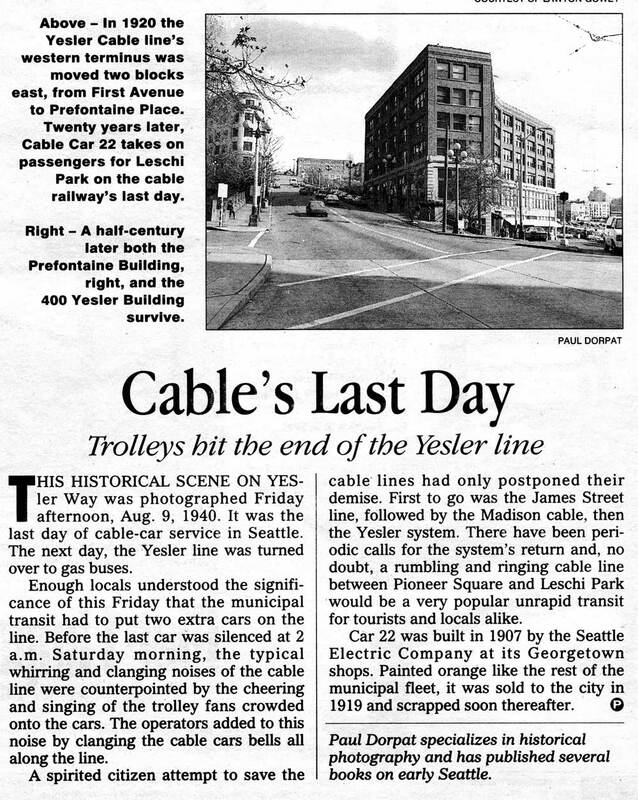 Before City Hall began to extend to Yesler Way, the northeast corner of 3rd and Yesler was taken by a real estate agency pushing the York Addition, which was on the Rainier Valley trolley line to Columbia City. The Kastle is on the left. Municipal surveyors posing on 3rd at the front stairs to city hall. 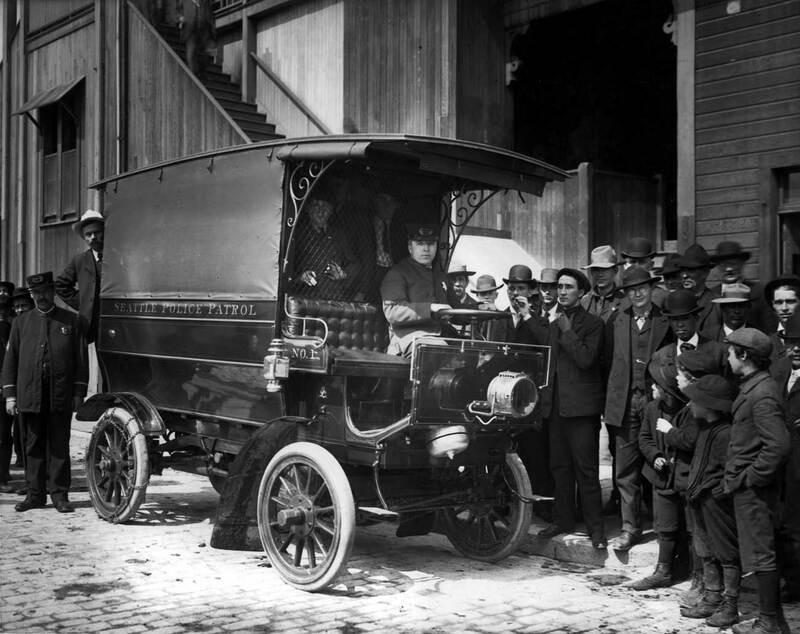 Seattle’s first horseless carriage came to town in 1900. Four years later, the city took an offical count. 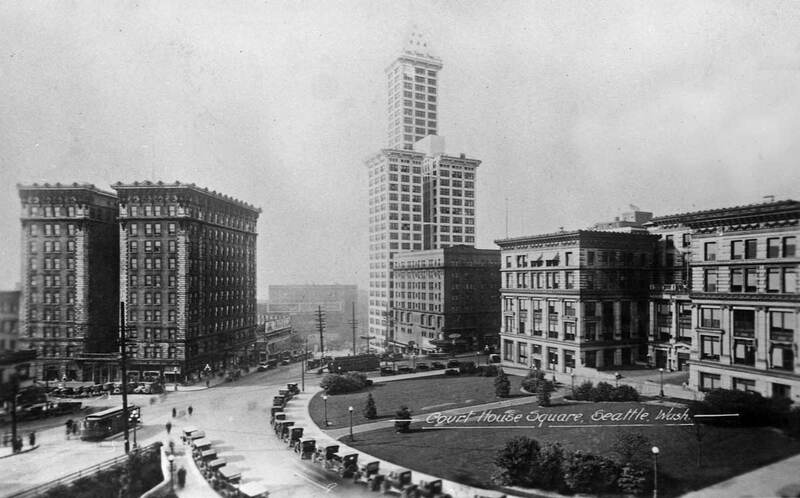 For one day in December 1904, the Seattle Street Department counted and typed every vehicle that passed through the busy intersection of Second Avenue and Pike Street. The tally came to 3,959, but only 14 of them were automobiles. But by 1907 America and Seattle were automobile crazy. Every issue of the daily newspapers featured something about them. 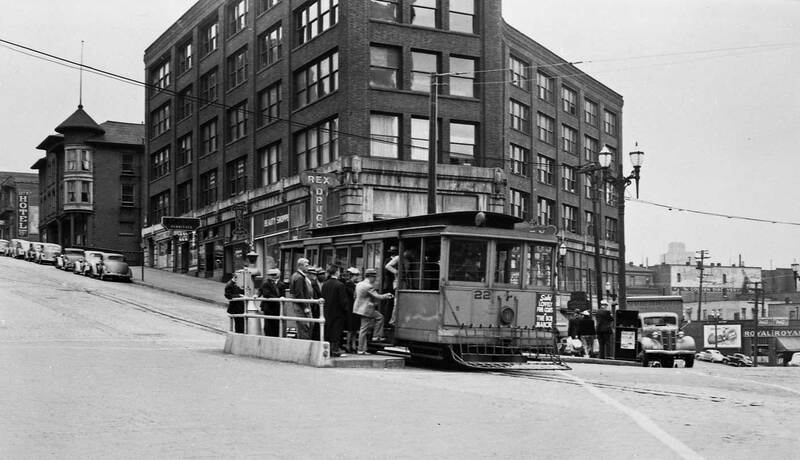 And although most American families could not afford to “get the motorcar habit,” there were, in Seattle at least, three chances to ride in one. And it measured up. The earliest record that contemporary police historian Capt. Mike Brasfield could find for the paddy wagon’s performance is from 1909. That year it made 7,637 calls, an average of almost 21 calls a day. But since it traveled an inner-city beat, its seemingly low 8,547-mile total included a lot of short trips to the jail. 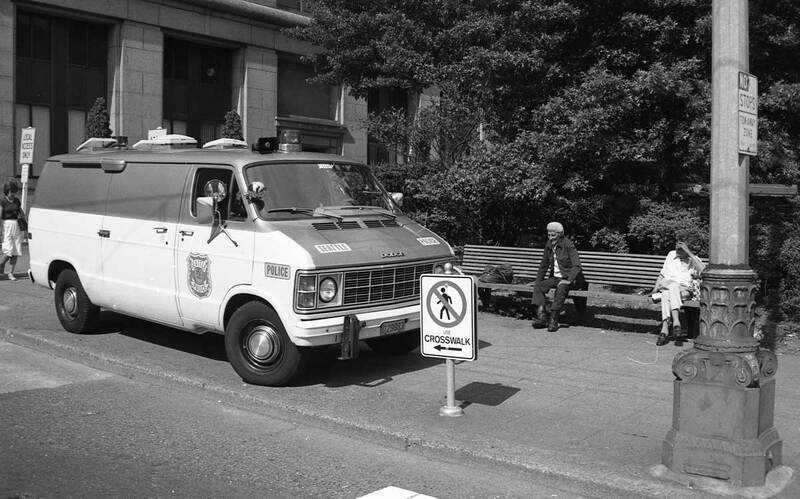 Pictured in today’s contemporary photo is one of the department’s four modem vans. [In 1984] This one’s radio call name is David-Ten. It’s parked in the same spot as old Black Maria (actually about 20 feet to the north of the “then”, but today the site of the old City Hall is called City Hall Park. This rare circus scene was copied from an old family album compiled early in the century by a Capitol Hill couple, Delia and Lewis Whittelsey. Though the couple had no children, they left plenty of photographs. This scene was pasted into the album without a caption, but its location and approximate time are easy to track. The circus was set up on what was called the “old Yesler site,” a full city block between Third and Fourth avenues and Jefferson and James streets, often used for such occasions after 1901 when the Yesler Mansion was destroyed by fire. The camera was aimed to the northeast across the block where Sara and Henry Yesler began to build their 40-room mansion in 1883. The block is now completely filled with the bulk of the King County Courthouse. The landmark that gives the site away is the old First Baptist Church on Fourth Avenue, a short distance south of Cherry Street. Here its steep roof rises above the big top. 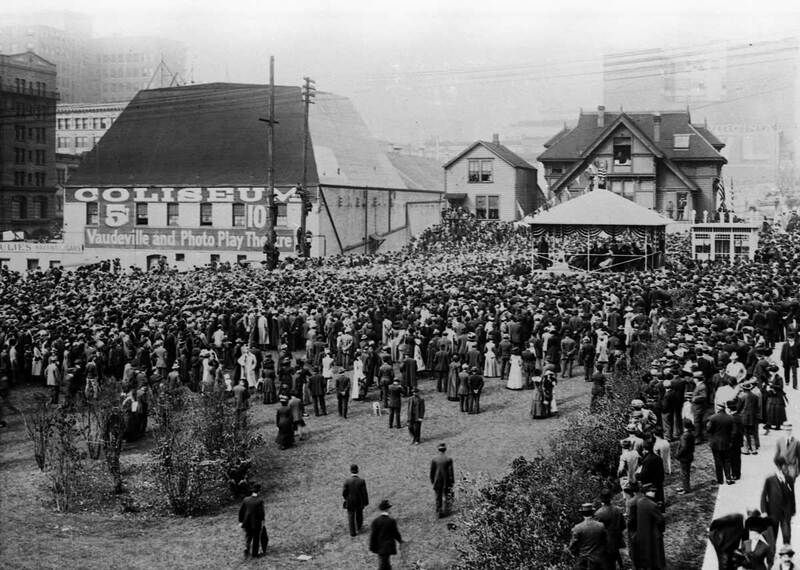 Between the destruction by fire of Yes!er’s mansion and the 1906 construction of the Coliseum Theater in its place, the old Yesler site was used for mass meetings or amusements like the London Ghost Show. In the second subject above the vortex ramp has nearly been surmounted by the climbing ball man. 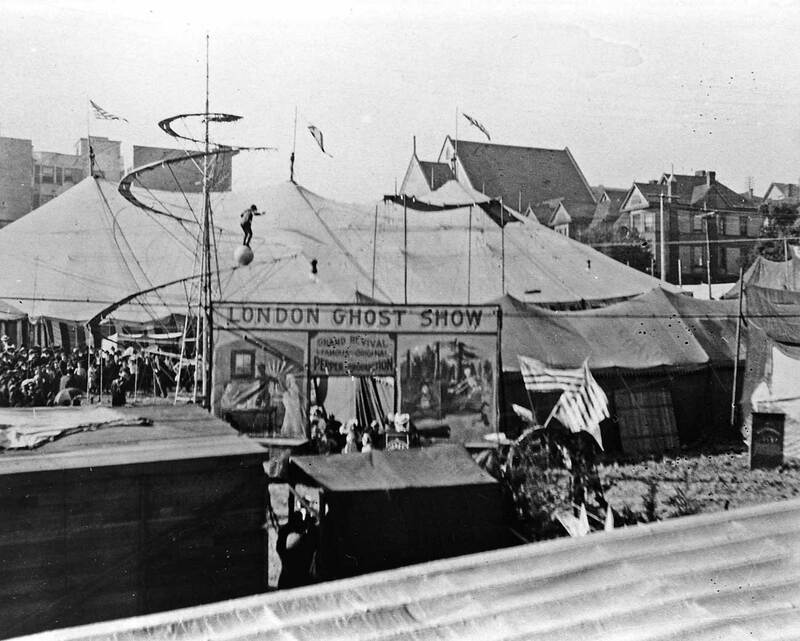 According to Michael Sporrer, Seattle’s resident circus expert, the London attraction was one of many sideshows attached to the La Fiesta and Alfresco Society Circus that performed here for two weeks in July 1904. It was the main attraction for the Seattle Mardi Gras’ and Midsummer Festival. Sporrer describes this production as an outstandingly unusual mix of circus and carnival acts. It included Fraviola, “the only woman in the world who loops the loop twice,” but who apparently missed a loop in Seattle and was badly injured. 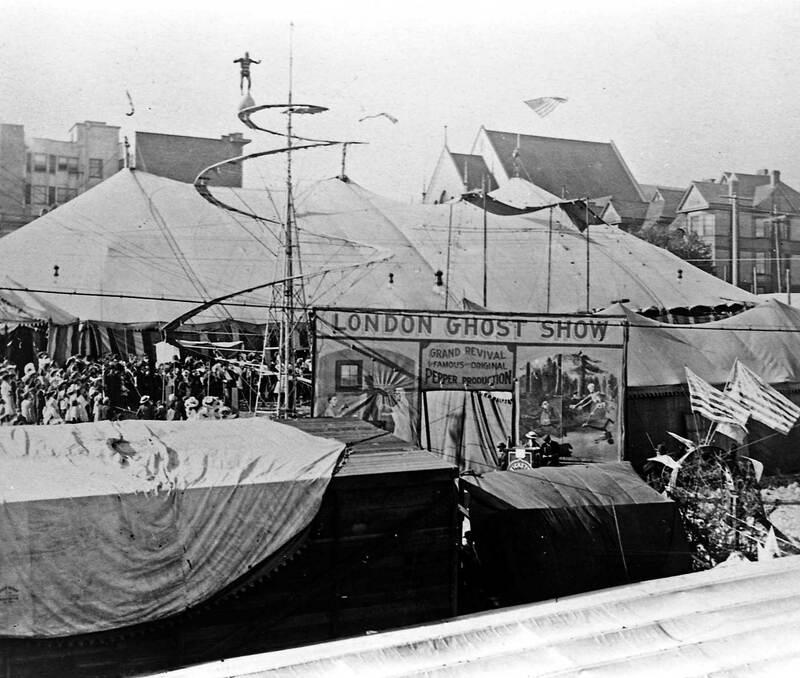 In the “now” photo, Sporrer stands well below the circus elevation but just a few feet from where the London Ghost Show once haunted the old Yesler site. 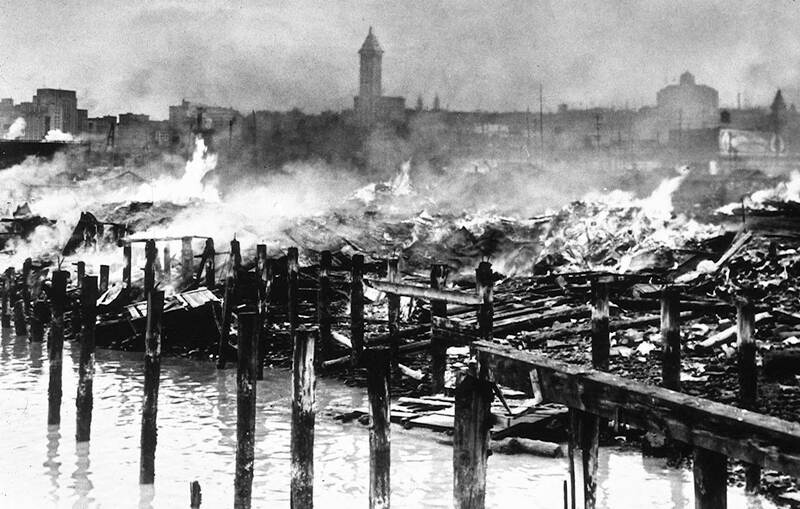 The fires in the fall of 1940 at “Hooverville” and other shack communities spread along the beaches and tideflats of Elliott Bay were a squatters’ Armageddon – with a posted warning. 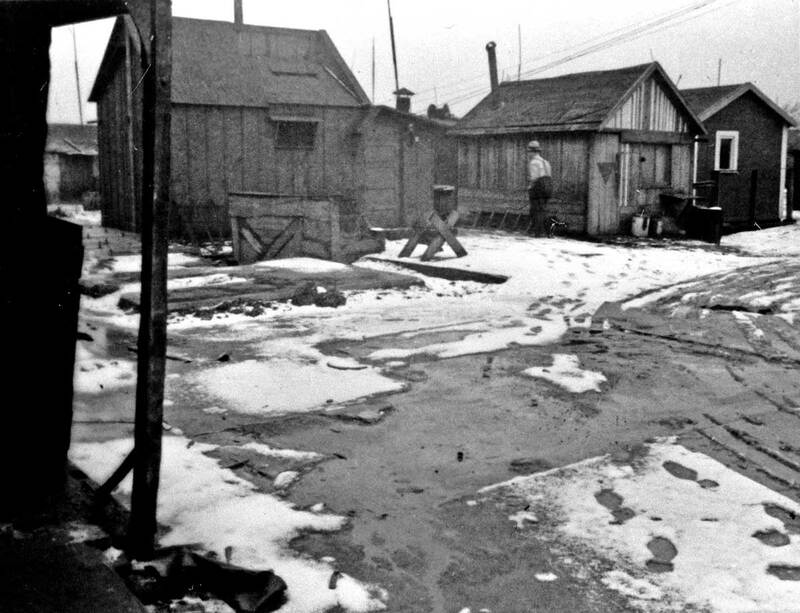 The mostly single men who lived in these well-packed, rent-free communities were told the day of the coming conflagration, so there was time for some of the shacks to be carefully trucked away to other sites not marked for wartime manufacturing. Packing it up before the immolation. This was quite different from the old Hooverville ritual of farewell. That was a kind of potlatch. When a resident found a job (a rare event), he was expected to ceremoniously give his house, bed and stove to others still out of work. In 1939 this gift-giving became commonplace; the war in Europe had begun to create jobs here, and among the residents of Hooverville were many skilled hands. 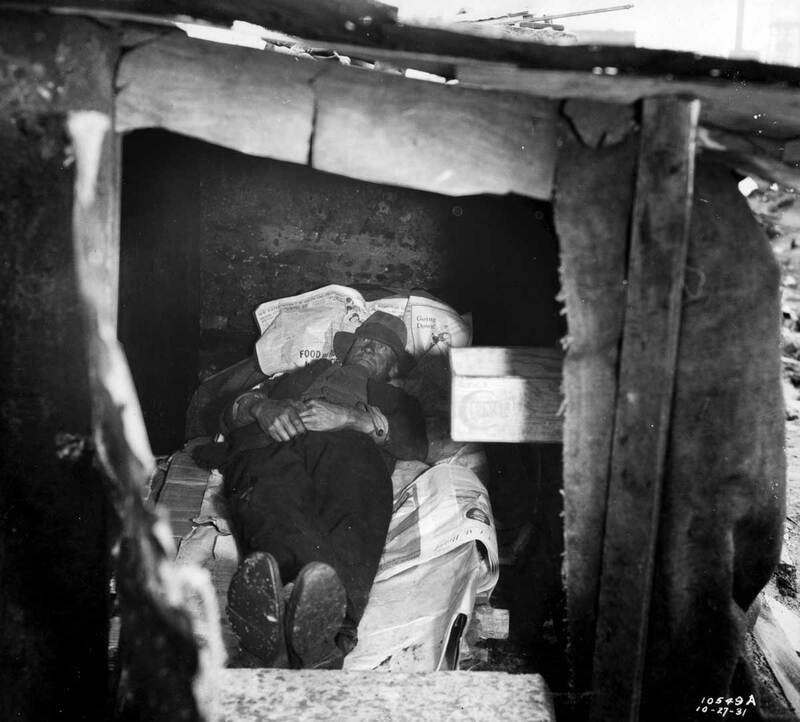 Squatters’ shacks had been common in Seattle since at least the Panic of 1893. Miles of waterfront were dappled with minimal houses constructed mostly of whatever building materials the tides or junk heaps of nearby industries offered. For the most part, these free-landers were not bothered by officials or their more conventional neighbors. 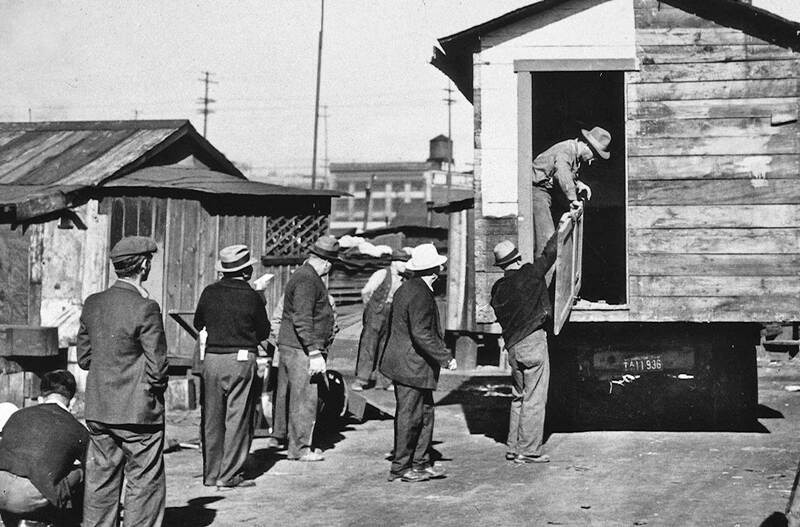 Swelling during the ’30s into communities sometimes of 1,000 or more residents, these self-policing enclaves were an obvious and creative solution to some of the worst effects of the Great Depression. Looking north over Hooverville from the B.F. Goodrich building on East Marginal Way. 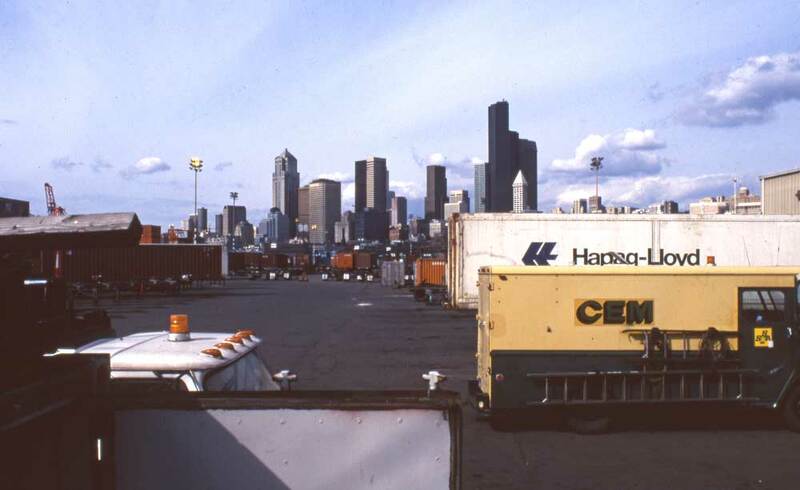 The coal bunkers at the waterfront foot of Dearborn Street appear on the left, and the Smith Tower on the right. A "now" (from, perhaps, fifteen years ago) below was taken from near the roof of the weighing station, a prospect that was close to the historical point-of-view. 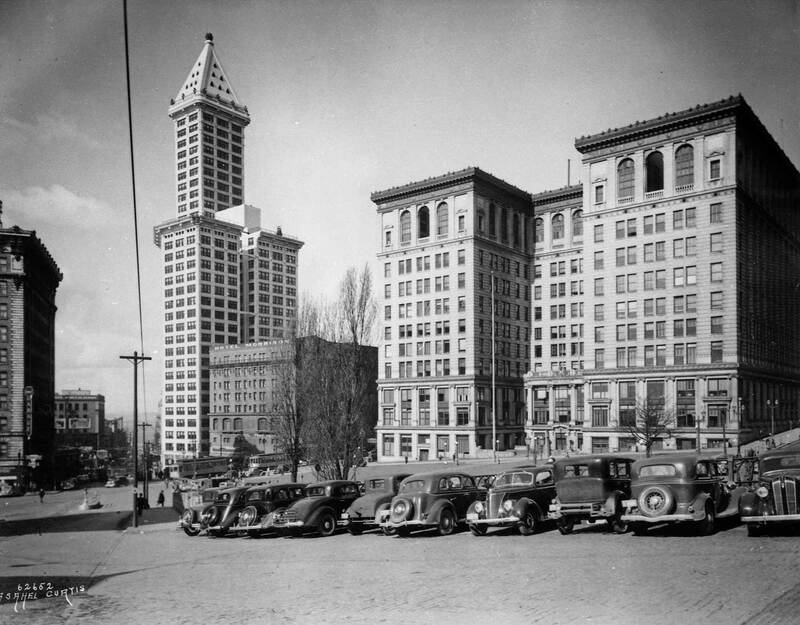 Like a medieval theme park or a child’s castle fantasy the City of Seattle allowed the Masonic Knights Templar to build their headquarters in City Hall Park for the order’s Grand Encampment of 1925. The City-County Building (1914) behind it had not yet reached its full height with the addition of five more stories in 1930 including the “penthouse prison”– the kind of castle designed to keep knights-in-error within. 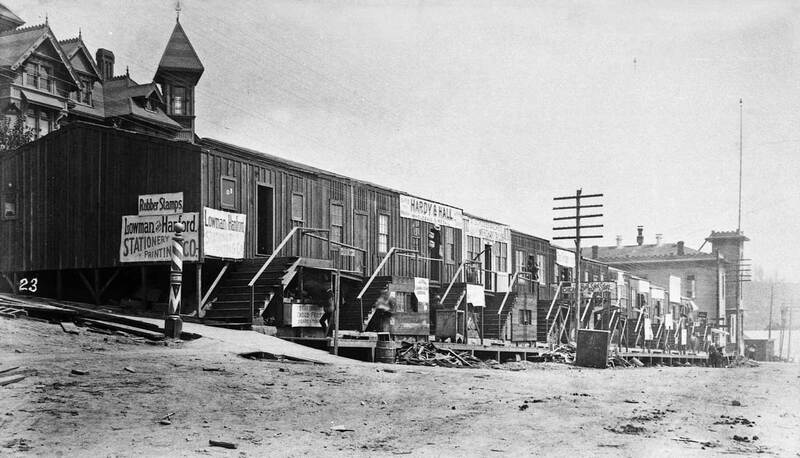 With more than thirty thousand Sir Knights and many of their dependents expected in Seattle for — to give the full title — the Conclave of the Grand Encampment of the United States of America for the Thirty-Sixth Triennial of the Knights Templar, a headquarters was needed which was both central and symbolic. This ersatz castle is it. Filling most of Seattle’s City Hall Park the Knights Templar headquarters was designed for the conclave by local Sir Knight architects including the Headquarters Committee’s Vice-Chairman Henry Bittman. But it was the Chair, John C. Slater, who envisioned the feudal castle. A castle-headquarters was appropriate, for this rite of Free Masonry was named for the medieval crusaders who, with Pope Honorius III’s imprimatur, were warriors for the faith, battling the Moors and protecting pilgrims in the Holy Land. So for the last five days of July, 1925 Seattle was overrun by plumed “Soldiers of the Cross Carrying the Banner of Christ” and erecting crosses everywhere, on light poles and roof tops. It was also projected by local Sir Knights that the visiting Christian Soldiers would drop between eight and ten million dollars into the Seattle economy. Each morning the castle’s drawbridge was lowered in ceremonies led by Boy Scouts. The walls of the interior courtyard were decorated with the seals of the Northwest states. Also inside were accommodations for the Conclave’s many committees including that which arranged the more than 2000 volunteer automobile tours of Seattle for the visiting Sir Knights and Ye Ladies. In a sign of the times, however, the Horse Committee could find only 210 good saddle horses — some shipped from Eastern Washington — for the event’s Grand Parade, not the 500 promised. 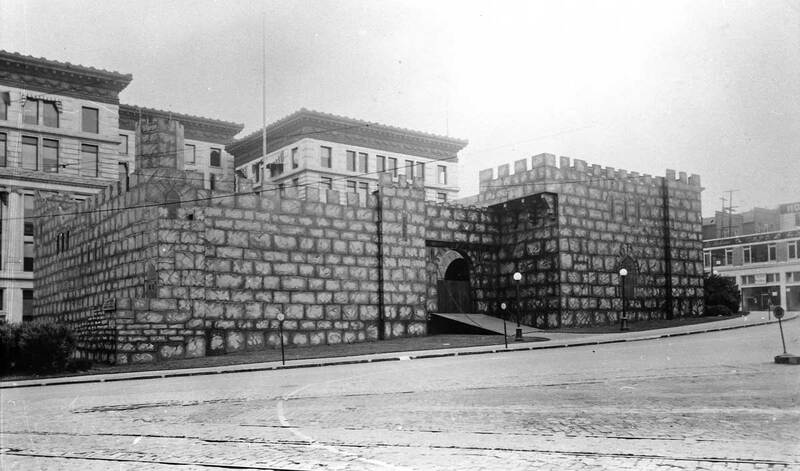 The Knights Templar castle-headquarters was another quixotic fit for a site with a history of warriors and even one other “castle.” Here during the Jan. 26, 1856 battle of Seattle the Navy’s howitzer balls splintered the forest hiding the Indians firing their small arms at the village. The Daughters of the American Revolution (DAR) commemorating that battle erected here in 1914 a surviving monument holding three canon balls. And it was here that King County built a frame courthouse in 1882 which was later enlarged as Seattle’s City Hall with such a topsy-turvy of additions that it was popularly called the Katzenjammer Castle: an allusion to the architecture included in a then poplar comic strip, the Katzenjammer Kids. 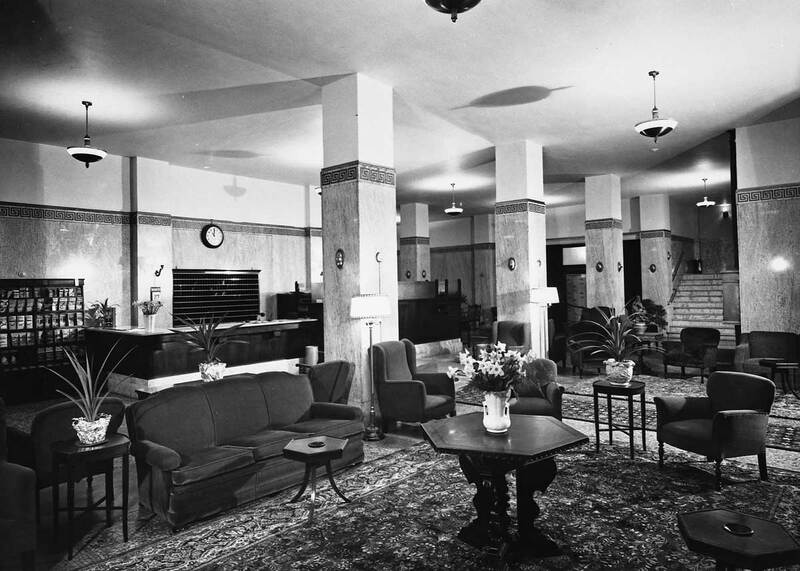 More recently, it was here during World War Two that Seattle’s Air Defense Wing, housed in the Frye Hotel across Yesler Way, practiced its daily drills. The Knights parading on Second Avenue. 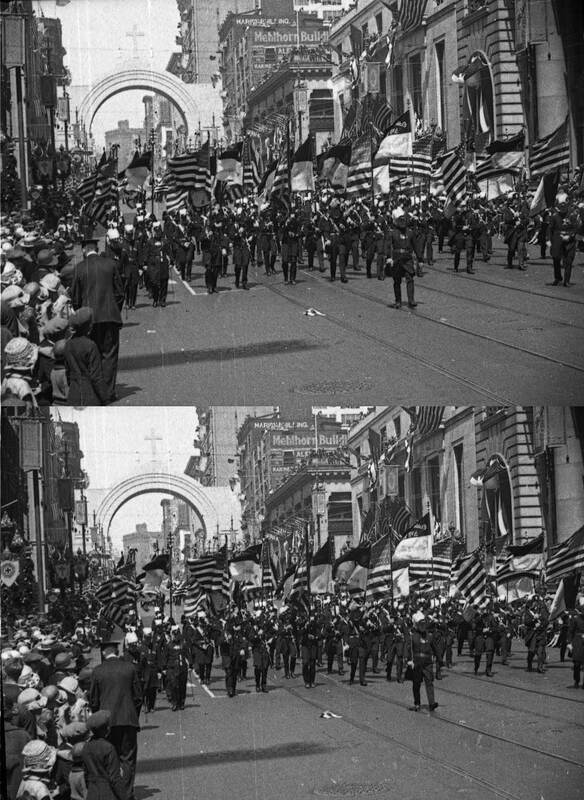 The two recordings looking north on Second to the temporary cross-topped arch built at Marion Street, are copied from Pathe news photographer Will Hudson's 16mm footage of the parade. 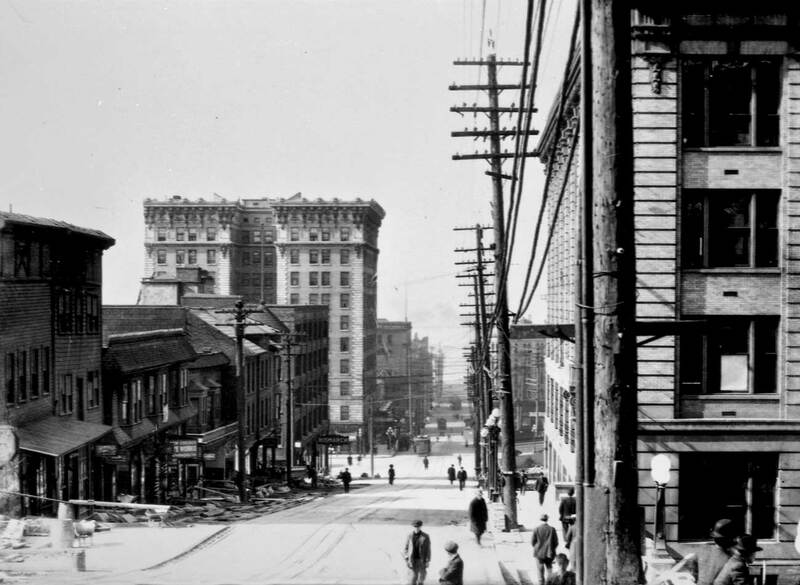 Photographed in 1911 or 1912, this view down Yesler Way from the Fifth Avenue overpass is dominated by two land-marks that still grace the neighborhood: the Public Safety Building, nearby on the right, and the ornate Frye Hotel, left of center. 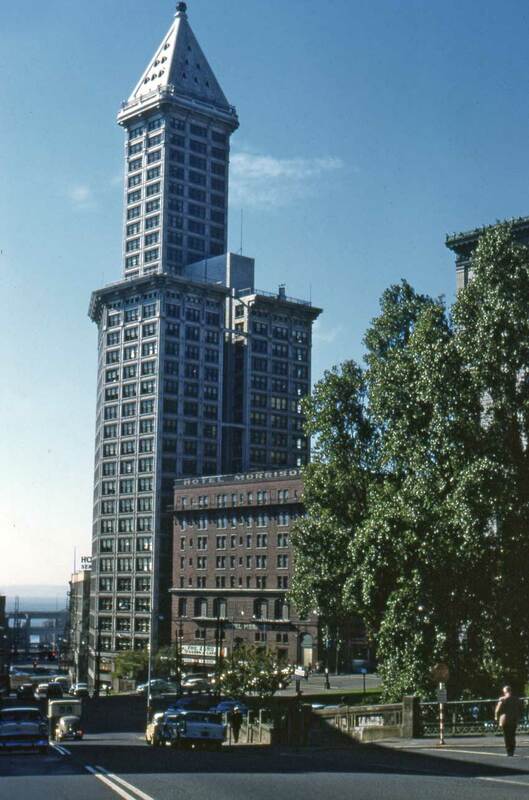 When it was completed in 1912, the Frye’s 11-story lift was second only to the 18 floors of the Hoge Building. 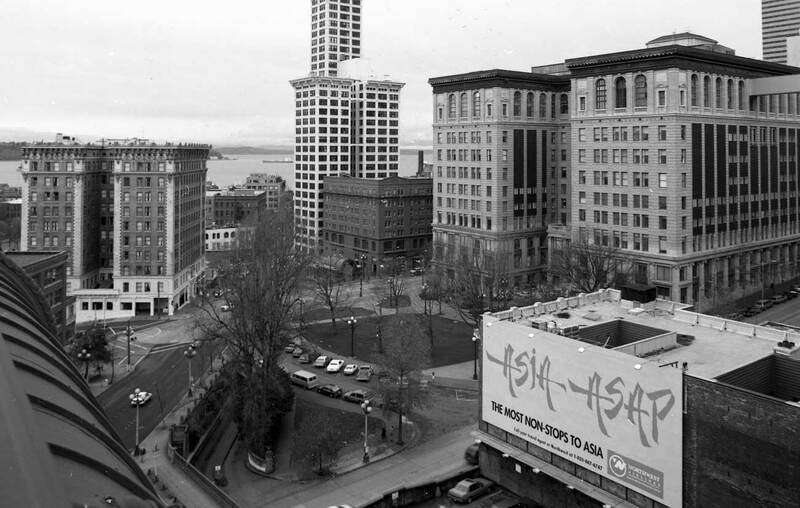 (One year later, across Yesler Way, the city’s skyscraping ambitions reached further toward the heavens with the 40-plus stories of the Smith Tower.) In 1972 the 375-room hotel was converted into 234 apartments. Nearly new and nestled between Yesler Way on the right and Terrace Street on the left. The old city hall and the new - the Katzenjammer, on the left, in its last days, and the new Pubic Safety Building, far right, that replaced it. The Public Safety Building was nearly lost. The City Council’s 1970 ordinance to destroy what was then an eyesore parking garage was stopped in the courts by local preservationists. 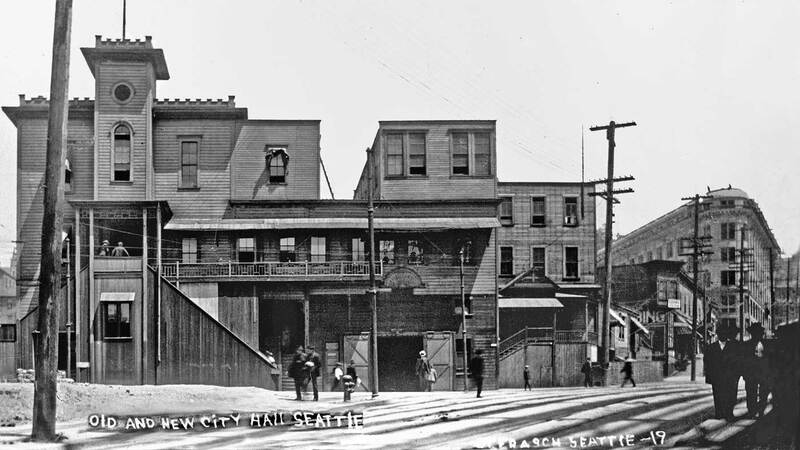 Built in 1909, the Public Safety Building was the first substantial structure planned exclusively for city use since Seattle’s clapboard central business district was destroyed in the fire of 1889. After its last municipal user, the Police Department, moved out in 1951 the city had difficulty finding a buyer until an auto body shop moved in and stayed 19 years. In 1977 the structure was beautifully restored as one of Seattle’s first renovation projects motivated by tax breaks for the owners. Then its newest occupant was its oldest, only the city was renting. 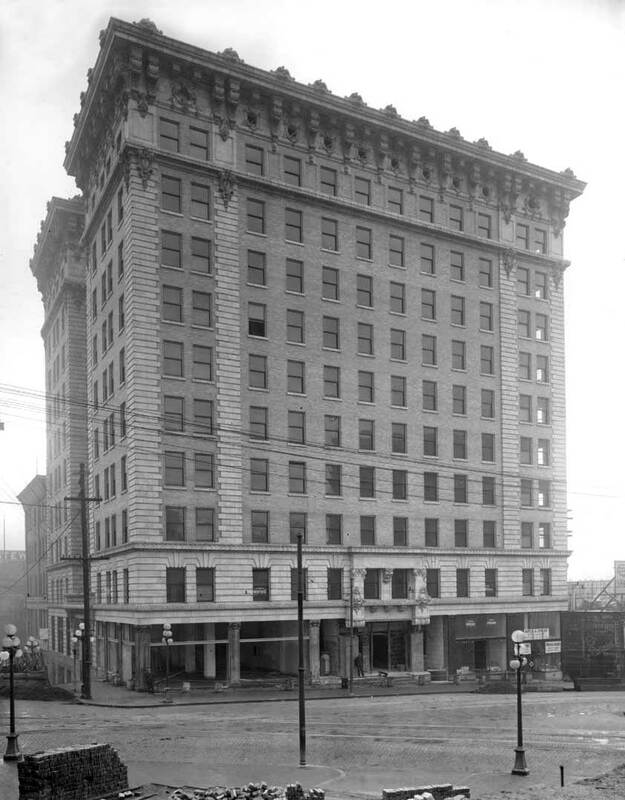 The Louisa C. Frye Hotel at the southwest corner of Third Avenue and Yesler Way was the last – and highest – joint production of Seattle pioneers George and Louisa Frye. Now retrofitted and restored the Frye Hotel is home for 234 low-income renters. It is (in 2000) the largest structure owned by the charitable non-profit Low Income Housing Institute that owns about 1500 affordable units countywide. The Archdiocesan Housing Authority manages the hotel. 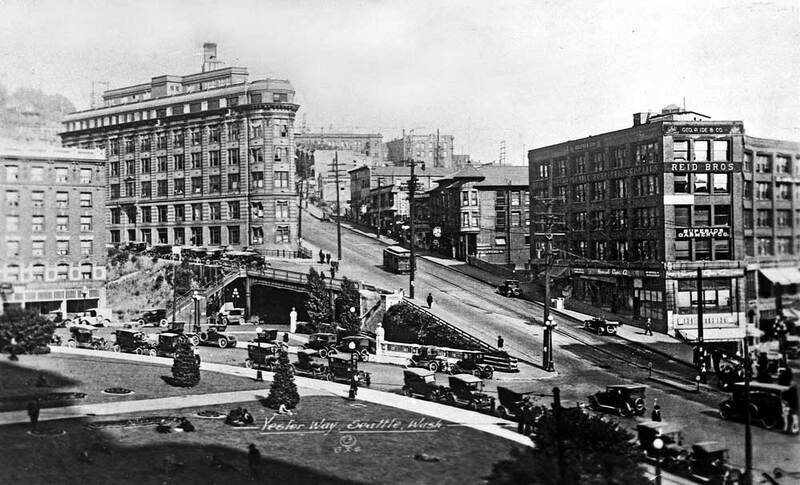 When it was new in1911 the Frye Hotel was described by consensus as simply the finest hotel in Seattle. It was also one of the highest of the city’s new steel-frame brick and terra-cotta tile skyscrapers. Here the construction continues at the retail level facing the sidewalk on Yesler Way. Eleven stories up the grandly ornamented cornice nearly overflows like a fountain at the cap of this elegant Italian Renaissance landmark. 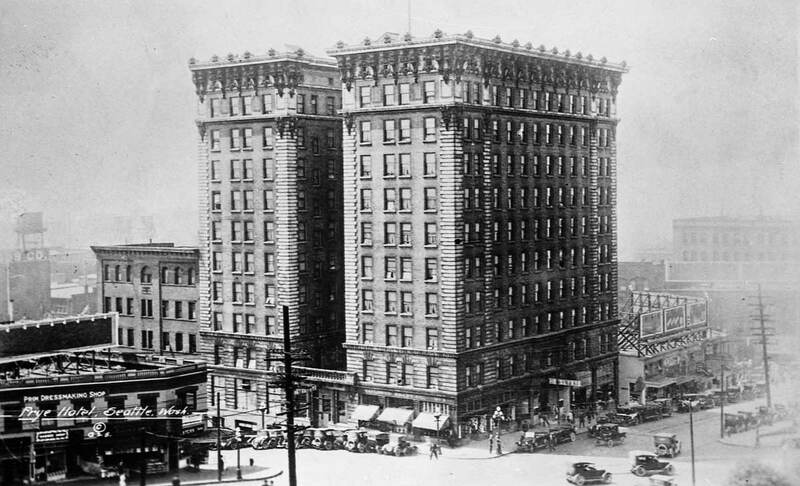 The Frye Hotel was the last of Seattle pioneer George F. Frye’s many accomplishments. Arriving in Seattle in 1853, the twenty-year-old German immigrant helped Henry Yesler assemble his steam sawmill and quickly became a favorite of Arthur and Mary Denny and later also of their daughter. Louisa just turned 17 when George married her in 1860. Together they had six children and many businesses, and Louisa was very much a partner in both. The children recalled how their father would never make a major business decision without the review and approval of their mother. 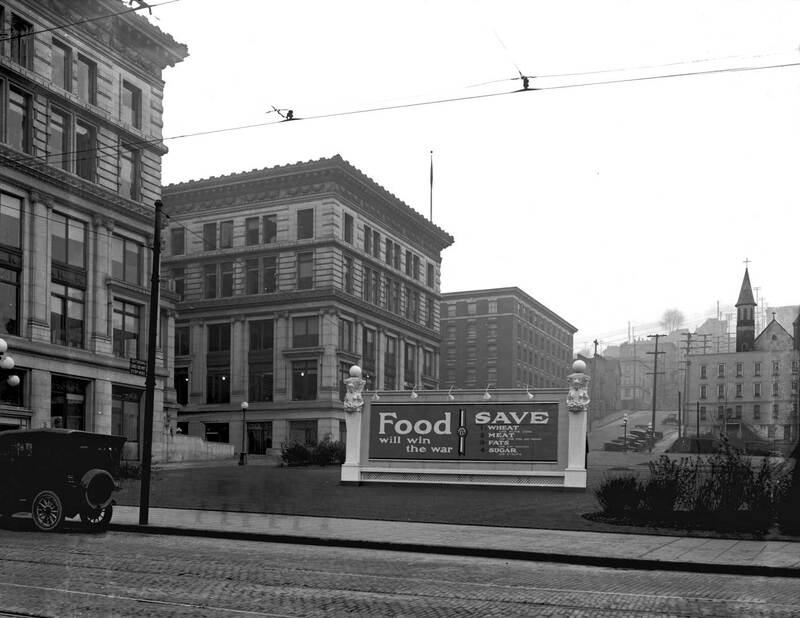 These partners ran the first meat market in Seattle, opened a bakery, raised the city’s first distinguished stage, the Frye Opera House (Frye also organized the community’s first brass band. ), built and managed at least three hotels, and invested in real estate with great success. For four years beginning in 1870 George Frye was also first purser and then captain of the Puget Sound steamer J.B. Libby when it had the federal contract to deliver mail to Whidbey Island and other points north. 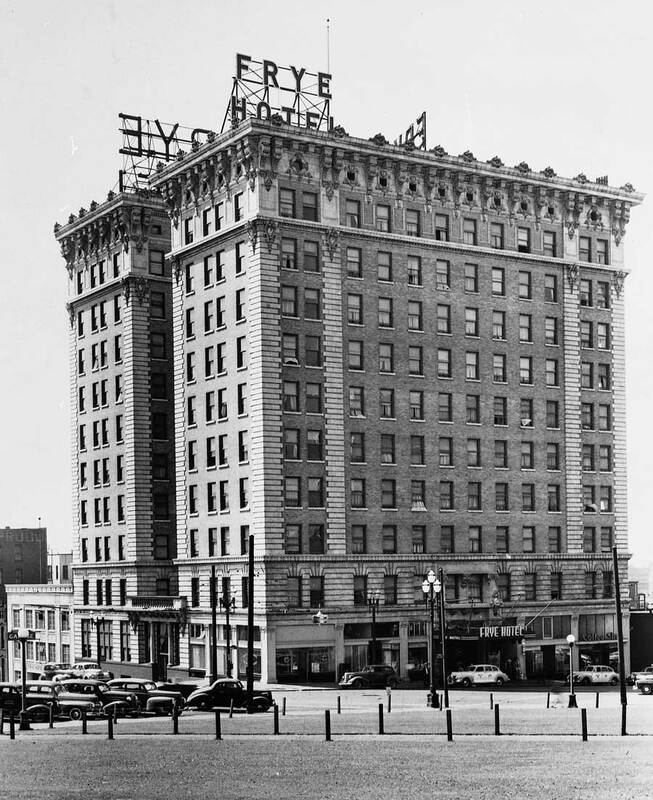 Typically, the Fryes formed their own contracting company to build their grandest hotel and George, entering his late 70s managed the construction. A little more than a year after the hotel’s grand spring opening in 1911, George F. Frye died. His widow, of course, continued to manage the Louisa C. Frye Hotel. George had named it for her. 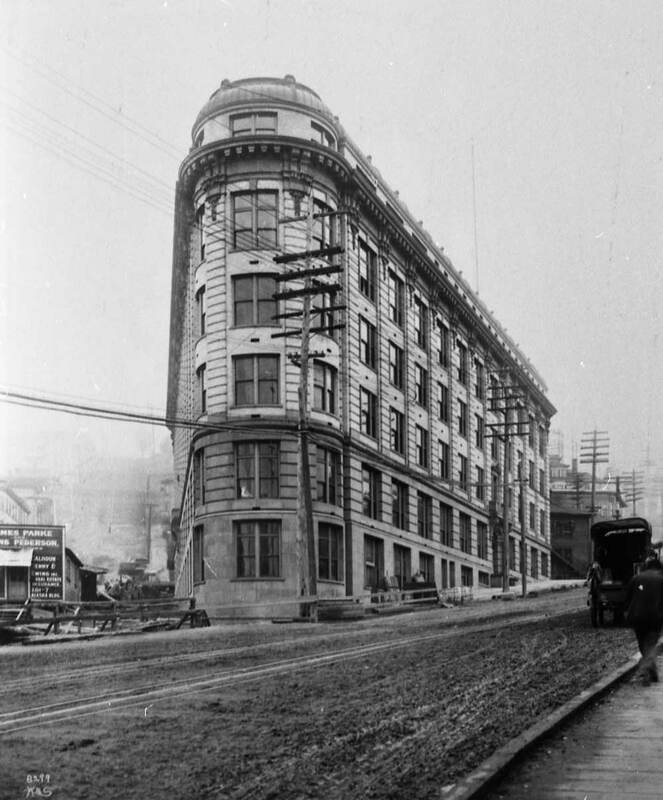 Although built near the train depots to the south the commercial heart of the city was already moving north from Pioneer Square when the Frye Hotel was opened. In the early seventies the hotel was converted into low-income apartments. Most recently the Low Income Housing Institute (LIHI) has purchased the hotel, restored the marble grandeur of its main floor, strengthened it against earthquakes, and repainted and appointed its 234 units. 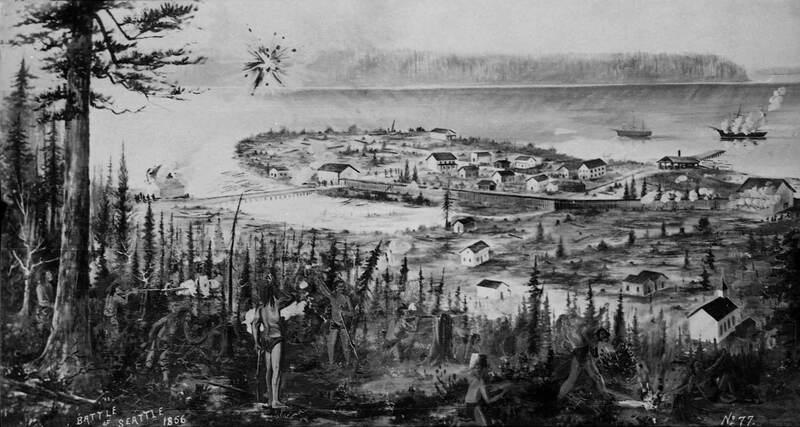 This Klondike Gold Rush-era view was uncovered by Mary Marx from a miscellany of family mementos. 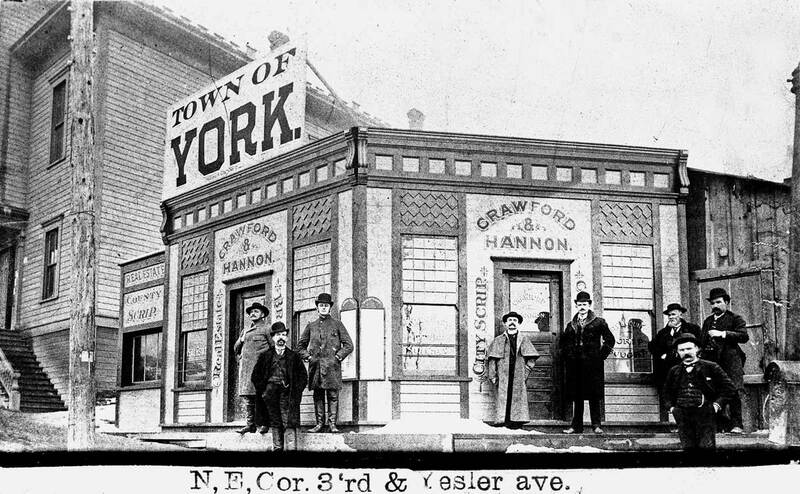 Her father, William Michel, is second from the left below the Frasch’s Cigars sign. Born in 1873, he is in his mid-20s here. The photograph is the conventional one of a proprietor and his store – assuming the owner is at the door or perhaps on the right. The man on the left, clutching the sack, is possibly a customer. Determining the exact corner of this photo was easy because of landmark steps to Our Lady Of Good Help on the far left. 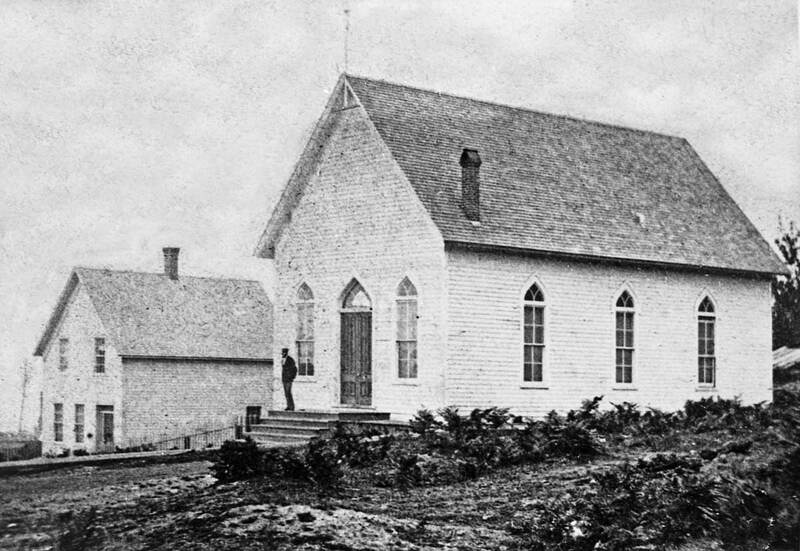 Seattle’s first Catholic Church was at the northeast corner of Third Avenue and Washington Street. Thus, this store is at the southwest corner of Third Avenue and Yesler Way, the present site of the Frye Hotel. And what kind of a store is this? 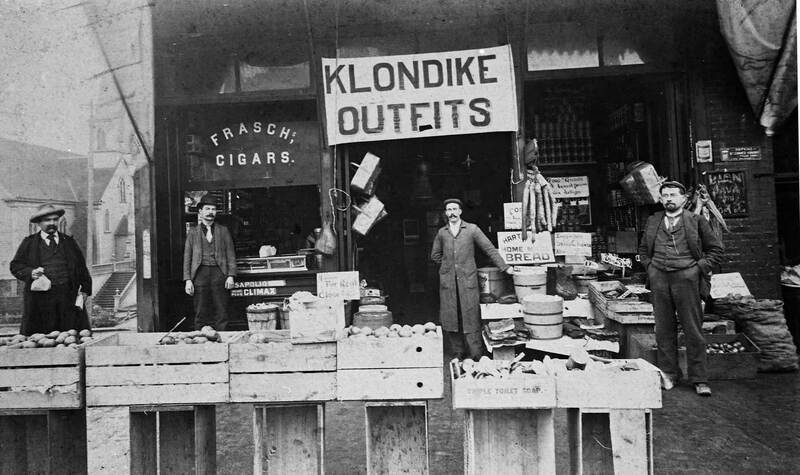 During the late 1890s the sign “Klondike Outfits” was almost as common as the sign “Lotto” today. And the buyer’s odds were about the same. Some of the items on sale here are homemade bread, slabs of bacon, blood sausages, imported Swiss cheese, all sorts of fruits and vegetables, and inside the paraphernalia for traveling men on their way to the Klondike gold fields. This 1870s record of Trinity Episcopal Parish’s first home at Third Avenue and Jefferson Street is also one of Seattle’s earliest photographic records. After the destruction of their clapboard sanctuary in the city’s Great Fire of 1889, Trinity built the stone church they still worship in on the James Street climb to First Hill. In 1910 the old church site was taken for the home of the Arctic Club, since converted to the Morrison Hotel. Beside it to the south is the Third Avenue and Yesler Way entrance to the bus tunnel. When measured by its seating, Trinity Parish’s church — with a footprint of only 24 by 48 feet – was, when new in 1870, the largest sanctuary in Seattle. Still its simple unadorned style made it seem smaller than its neighbors, the Roman Catholic and two Methodist churches. They had towers. This scene may well date from the early 1870s when the building still faced north and south at the northwest corner of Third Avenue and Jefferson Street. The view looks west toward Elliott Bay where the masts of a tall ship moored beside Yesler Wharf can be seen faintly on the far left. In 1880 the building was turned 90 degrees and a tower added for what was then claimed to be the largest bell in Washington Territory. The church was also lengthened for a chancel and the territory’s first pipe organ. Much of Trinity’s materials were donated, but not the Gothic windows which were purchased in San Francisco. Typically with pioneer congregations it was the women who were most responsible for raising the funds to build, adorn and run their churches. In a recollection on church history pioneer Trinity parishioner Mrs. E.E. Heg recalled how the town’s industrialist Henry Yesler also once helped spank some coin for the building fund. At a benefit held in his namesake hall, Yesler announced to the women “Now, I will help you make some money. I will go and get a crowd of the boys and get sticks for them to whittle, and bring them in here, and we will whittle all over the floor, and you must make them all pay something for the muss they make.” Yesler soon returned with an entourage of the village’s leading capitalists. In order, he made them buy and put on the women’s aprons, whittle on the floor, and pay to have it cleaned up. While the popular standing room only parish was raising funds to build a bigger sanctuary on First Hill it lost its original sanctuary to the city’s “Great Fire” of 1889. It was the only structure destroyed on Third Avenue north of Yesler Way. 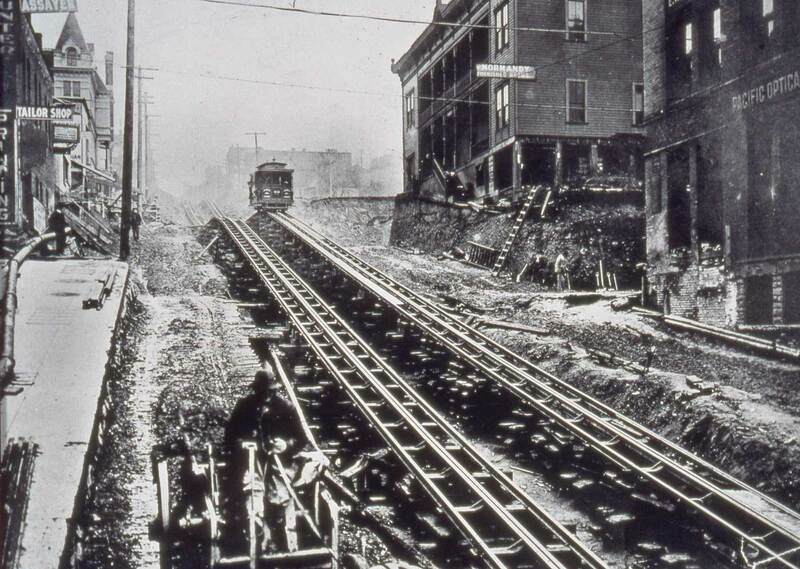 Neither commonplace nor rare, all early-century views of the James Street regrade also show tampering with its cable railway. 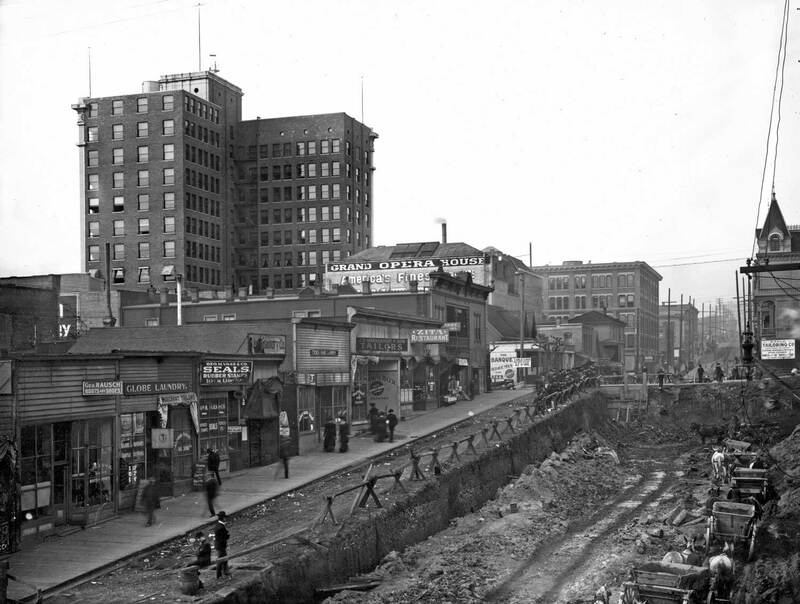 The regrading on James Street was episodic, contingent on the north-south upheavals of Seattle avenues, first on Third in 1906, next on Fourth in 1908 and so on to Fifth and Sixth. This view looks east up James from Second Avenue. The temporary holding of the cable railway on blocks at its original grade continues as far as Fourth Avenue. The date is early in 1906. 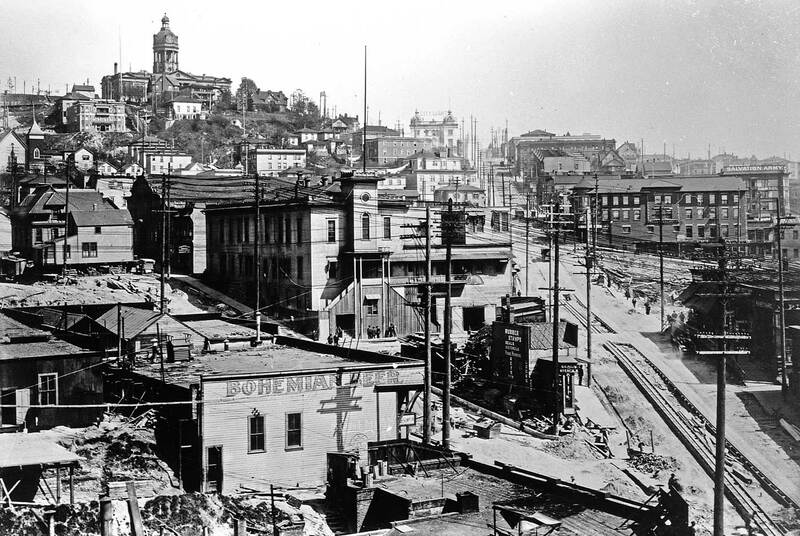 In an October view from the same year, the structure with the tower, upper left has been removed and a block-long vaudeville theater is under construction at the southeast corner of Third and James, just to the right of the cable car. The considerably rarer subject here is the old frame structure, center right, at the southwest corner of Third Avenue and James. The sign protruding from its west wall reads “Normandy Furnished Rooms,” but not for long. The name was soon changed to The Drexel, and a brick floor added to the hotel with the lowering of both James and Third. The ladder leaning beneath the Normandy is a kind of caliber of both the cut and the space available for the eventual excavation of a new ground floor. What is totally unique about this building is that it survives as the oldest structure in the Central Business District. Built as the Ingels Block shortly before the city’s “Great Fire” of June 6, 1889 it barely escaped it. The Collins family home to this side of it on Second Avenue (a portion of the replacement Collins Building appears far right) as well as Trinity Episcopalian Church, south of the Ingels on Third Avenue, were both destroyed. Soon after the fire the name of the hotel was changed to Normandy. Surviving with it were the homes of Henry Yesler and Bailey Gatzert, neighbors across Third Avenue and James Street respectively. The Ingels-Normandy-Drexel was already treated as “historic and old” in 1944 when Seattle Times reporter Bob Burandt noted that “the upper two stories are now getting a ‘beauty treatment’ rather than be torn down, and workmen have been at the ‘covering up’ process for some time.” The new cement-asbestos board covering was required by a then new fire code. Beneath it is the clapboard of the original Ingels as well as the ground floor Drexel brick addition. In 2000, or thereabouts, this oldest of structures downtown got a facial by the Samis Land Company, its present owner. There were plans, at least, to steam-clean the exterior, and the original Drexel first floor facing Third Avenue was to be restored. In 200 when this was first written, a corner tenant to replace the half-century old Spin Tavern had not been identified. Another regrade - on Third - and another look at the Drexel, (at the center, below the Opera House sign), at the southwest corner of Third Ave. and James Street. This look was recorded from the old Katzenjammer Kastle City Hall in 1906. The back walls of the Alaska Building surmount the scene left-of-center at Second and Cherry. What we now refer to as the King County Courthouse was first known as the City-County Building when Seattle’s mayor George Cotterill and the King County Commissioners agreed to build and share the new building both needed. Construction began in June 1914. 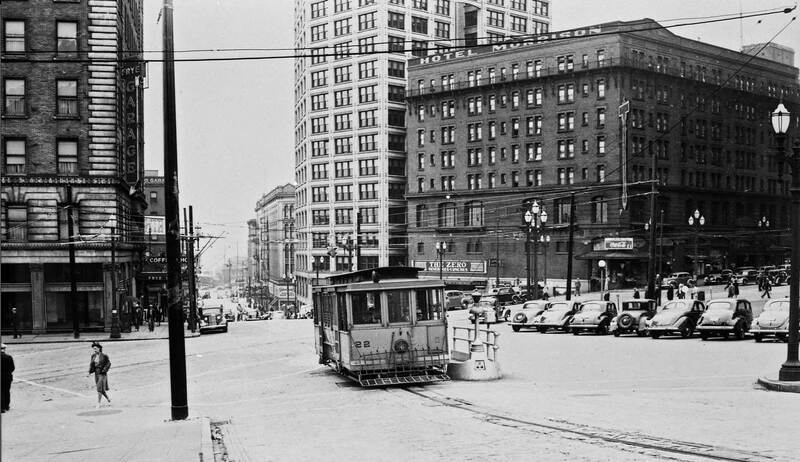 This view looks east across 3rd Avenue to where the building’s south side faces what is now called City Hall Park. 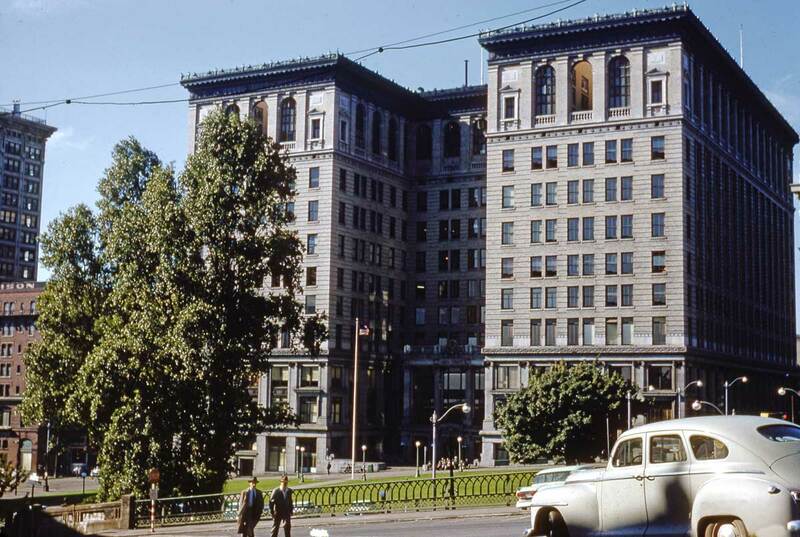 For fifteen tiring years litigants negotiated First Hill to meet with bureaucrats at the King County Courthouse at 7th Avenue and Alder Street. 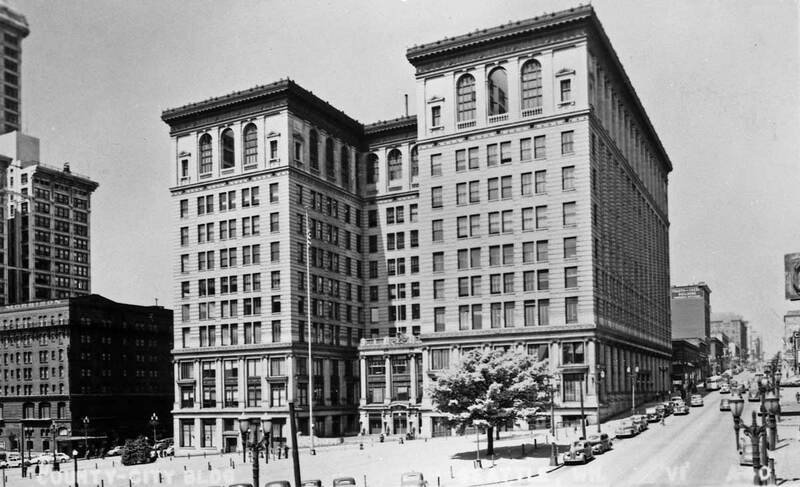 Consequently, that part of the hill overlooking Pioneer Square was often called “Profanity Hill.” But on May 4, 1916 the new courthouse was dedicated, and it suited the Central Business District well, for it looked more like an office building than a courthouse. The architect of its first five floors, the commandingly named Augustus Warren Gould, was censured by his peers and kicked out of the American Institute of Architects. In the book “Shaping Seattle Architect,” Dennis Anderson explains with his essay on Gould that the architect “violated professional ethics to secure this commission siding with Pioneer Square property holders who fought relocation of city-county offices to the [Denny] regrade area.” Still Gould kept the commission and this is the result. The U.S. Food Administration’s sign “Food Will Win the War” certainly dates this view from sometime during the First World War. In addition to soldiers and munitions the nation was also sending food to Europe and homemakers were signed up as “kitchen soldiers.” School children recited this rhyming pledge. “At table I’ll not leave a scrap of food upon my plate. And I’ll not eat between meals but for supper time I’ll wait.” These were the years when horse steaks were sold at the Pike Place Market, President Wilson turned the white house law into a pasture for sheep, and the country’s 20th century long march to obesity was temporarily impeded. 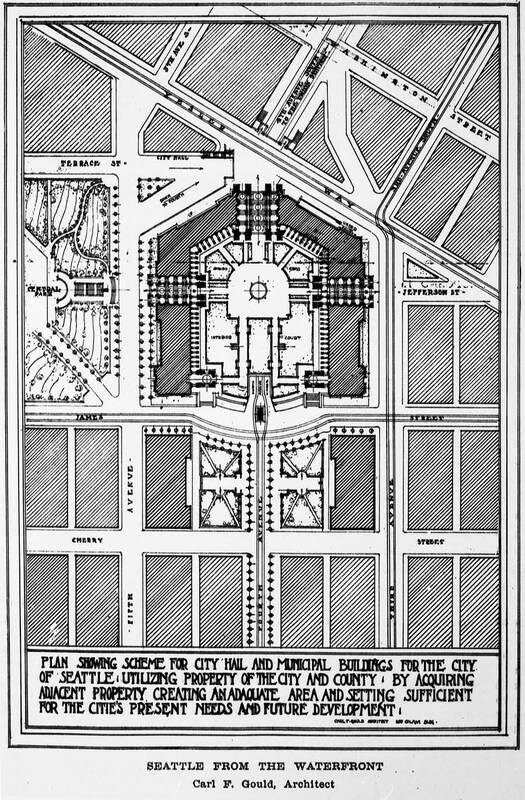 Gould's first and grander plans for developing the neighborhood into a civic campus..
City Hill Park from the Smith Tower. On the left horizon, construction work is progressing on Harborview Hospital. The condemned Court House to this side of it will soon be razed, 1930. In the first 11 years of “now and then” this was the first painting selected. 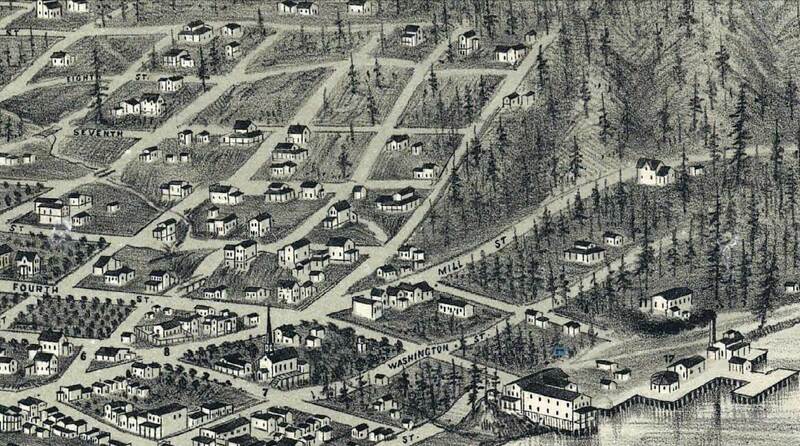 It is a bird’s eye view of the village of Seattle on Jan. 26, 1856, the day of the Battle of Seattle. The painting is long familiar to me but in photographic copies only. If the original oil survives, I’ve not found it. Until now, all the copies I’d come upon had part of their center obliterated by the reflecting glare of the photographer’s lights (see below). Now Michael Maslan, a local dealer of historical ephemera, has uncovered this print without the glare. It was part of a montage of early 1890s scenes photographed then by local professional William Boyd. Participants’ reminiscences of this battle are varied and often conflicting. Estimates of how many Native Americans were in the woods vary from a few hundred to several thousand. 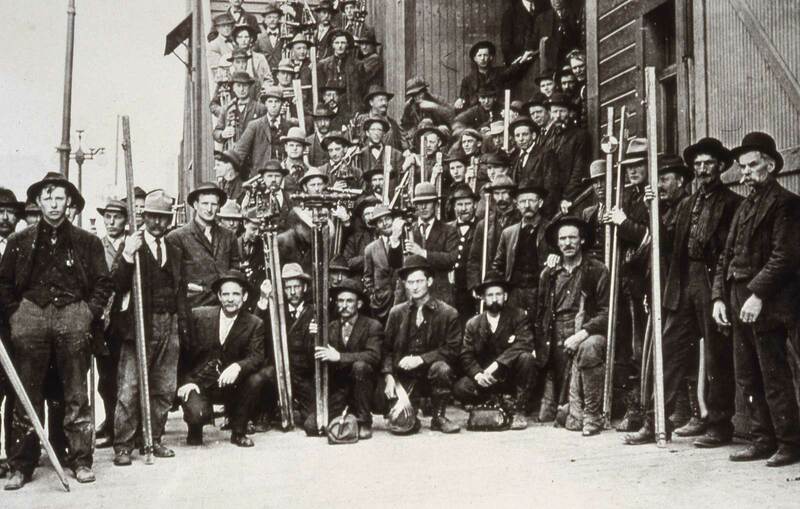 Many, perhaps most, were Klickitats and Yakimas who had come across Snoqualmie Pass. The range of their trade rifles was generally too limited to rain accurate mayhem on the village. So, by some reports, they had planned to storm the community while the sailors breakfasted aboard the sloop-of-war Decatur. Their intentions (or, possibly, merely their presence) was betrayed by an informer, and the battle was begun not by the natives but by the Decatur’s cannon. The howitzer’s report was so loud it could be heard across Puget Sound. The Native Americans answered with small-arms fire; the startled settlers rushed in a general panic from their cabins to the blockhouse they had built weeks earlier on a knoll at the foot of Cherry Street. The battle began at 8 in the morning and continued with some lulls until dark, when the Native Americans burned many of the pioneers’ homes before retreating to Lake Washington. Two settlers and, most likely, many more Native Americans were killed. The painting depicts the Decatur firing from offshore, a shell exploding in the air, the puffs from the settlers’ and sailors’ rifles. But in the painting the Indians are too far from the blockhouse. Most reminiscences of the battle put them in the thick forest that still bordered the community at Third and Fourth avenues. So the painter’s imagined prospect is too high above the Methodist Church included at lower right. The White Church, as it was called, was at Second and Columbia. Most likely the painter put the Indians high on First Hill because he or she wanted to look down on Seattle, not across to it. 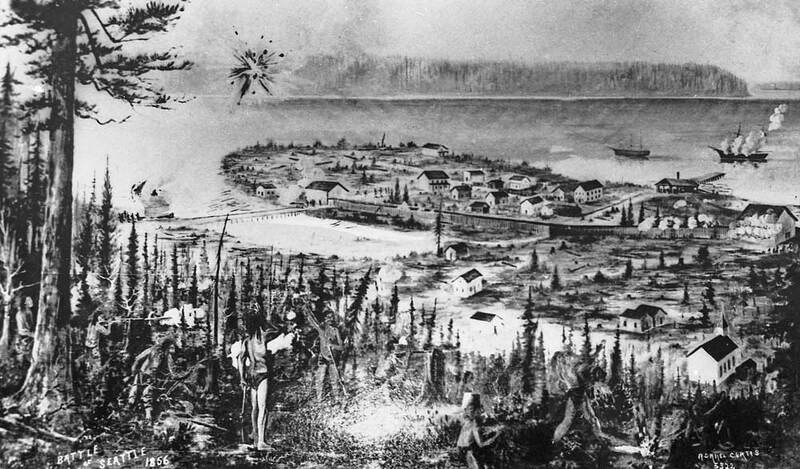 And his birdseye view not only adds to the event’s drama but also shows well how in 1856 most of Seattle was set upon a peninsula – named Piners Point by the Wilkes Expedition in 1841 – which extended into the tide flats south of YeslerWay.